Fast forward 46 years, and electric power is now practical, affordable, simple, and reliable. Ah ha! Let’s shrink down the 92-inch original design and simplify it. 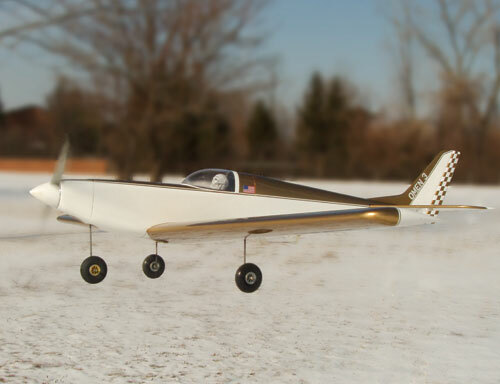 Many of the older pattern ships make great sport models today, and I thought it would be a sure winner designed around the reliable E-flite Power 46-size setup. So here we have the result, the 63.5-inch-span Omen III. It is an all-wood design, with a minimal parts count. I’ve used standard size woods throughout, switched to a fully symmetrical wing section, and gotten rid of half the wing ribs. I went from one aileron servo to two. The prototype was built from design start to finish and ready to fly in seven weeks of evenings, so your model will go even faster! The finished ship is only 4 pounds, 12 ounces with a 4S 4000 battery, for a light 19 ounces of wing loading and a healthy power loading. She’s even lighter with a 4S 3700mAh pack.